Emily Perlock works with two Penn State students who are learning to tell the age of a bird by looking at wing feathers. 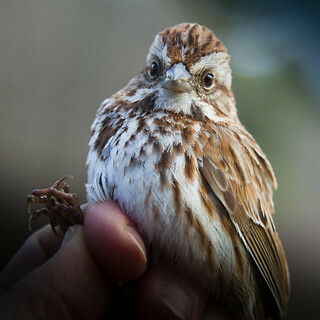 And so our bird banding season is underway! Licensed bird banders Emily Perlock, Scott Stoleson, and Don Watts generously give their time, talents, and expertise to show visitors how scientists collect data on birds. 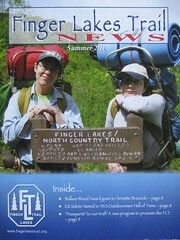 Throughout the season, Terry LeBaron and I will be taking pictures to be used at our September First Friday program. 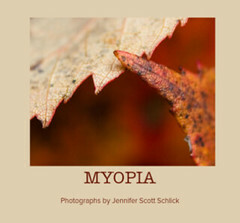 In addition to giving highlights of the banding season, there will be a quiz and maybe even prizes! 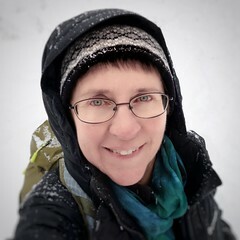 I was only able to stay for a short while on Saturday. Still, I was able to see lots of birds. 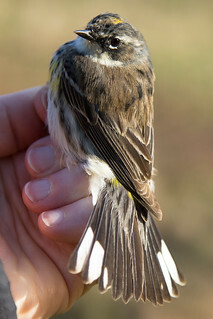 One of the most surprising things happened during the first net check: fifteen Yellow-rumped Warblers all in the same net! 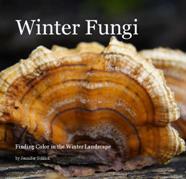 Over the years, the banders have rarely seen “butter butts” here at Audubon. 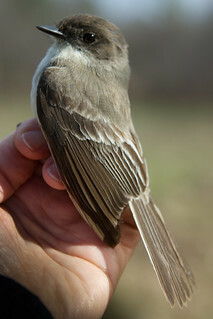 Veteran bander Scott Stoleson says this species can be tricky to age. Penn State students Clay and Nathan got LOTS of practice! 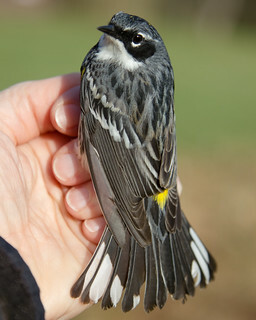 These are both Yellow-Rumped Warblers. 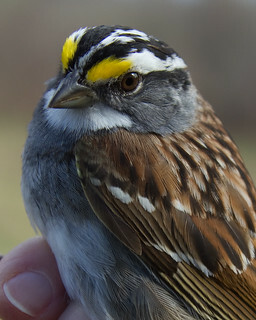 Another migrant with similar bold yellow, white, and black is the White-Throated Sparrow. We caught several on Saturday. 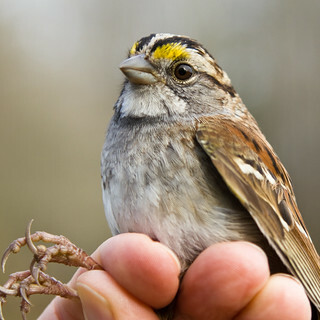 Click here to see the White-throated Sparrow range map on the Cornell website. 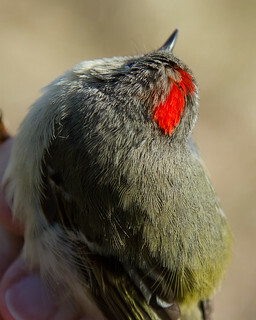 The Cornell site describes the Ruby-Crowned Kinglet as a “tiny bird seemingly overflowing with energy.” We were delighted to catch a few of these on Saturday! 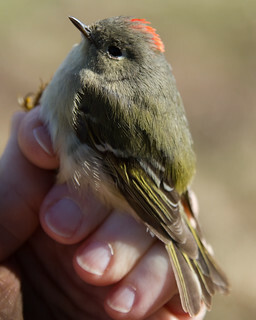 Click here to see more information about Ruby-Crowned Kinglets. I left banding early on Saturday to attend a bridal shower. I’m told there were many other wonderful birds in the mist nets. In addition, Don Watts and friends climbed up to one of our Screech Owl boxes and banded an owl! Wish I had been there for that! 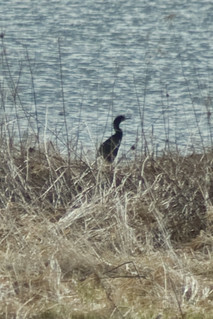 Double-crested Cormorant at the farm pond on Route 62. 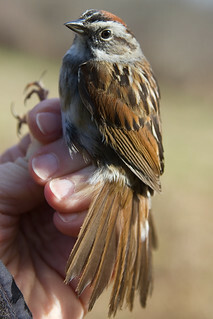 Spring banding demonstrations continue for three more Saturdays. After that, Emily Perlock and her students will continue MAPS banding through the summer. 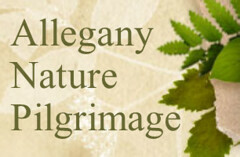 Check Jamestown Audubon’s website for schedule information. Bonus! On the way home, I saw a bird at the farm pond along Route 62 between Audubon and Jamestown. Turned out to be a Double-crested Cormorant! I wonder if you caught ‘mine’? They left here (north Georgia) a few days ago. I’ll be looking for bands when they return in the Fall. How gorgeous! I don’t have quite as much of a variety in my neighborhood, like the different kinds of sparrows (I didn’t even know there were swamp sparrows!). Looks like a fun task! The Purple Martins near my house are going to be banded this weekend and sadly I have to miss it! It looks like a fascinating experience.